Any fans of Alexis Masbou in the building? If you are not, you should be! The dude is pretty rad and has great style. 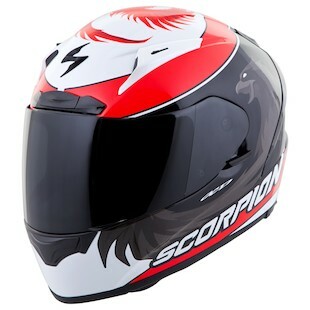 Even if you don’t know who he is (hint: he races motorcycles really fast), you will certainly dig the Scorpion EXO-R2000 Masbou Helmet from the Scorpion Fall 2014 lineup. Okay, so no joking, the EXO-R2000 is probably one of the highest bang-for-your-buck helmets on the market. The thing is out of this world awesome. As the flagship performance lid from Scorpion, it is constructed from a composite shell that blends 5 layers of fiberglass, Aramid, and organic poly-resin for a lightweight, highly resilient compound. At the same time, it has an incredibly low-profile shape that works to eliminate the bobblehead effect that can be seen when the outer shell of certain helmets is not well-tailored to the internal contents. Additional high-end features include the AirFit system to personalize helmet fitment through the cheeks as well as a Dark Smoke and a Clear faceshield. Now, if you are a fan of Greek Mythology… or you just have a thing for wild warbirds that regenerate from their own ashes (who doesn’t right? ), then this is going to be right up your alley. Seriously though, between a world famous racer and an eternally awesome mythological beast… this helmet kind of rocks!